The Digital Dating World has seen its fair share of companies come and go over the years, and few have been able to give the usual suspects, like eHarmony, Match.com and OkCupid, a run for their respective monies. However, since bursting onto the scene in October of last year, Tinder has been making a play to become the next digital dating giant by focusing on an area where few (if any) of its predecessors have excelled: Your phone. Drawing on the same addictive formula behind Hot or Not, Tinder allows those in search of a date (or a little casual flirting) to swipe through Facebook-powered profiles of prospective matches, accepting or rejecting based on visual appeal. Sure, it’s a bit superficial, but its game-ified approach to flirting is also more than a little addicting and has taken off among the SnapChat generation, beginning with college campuses. Yet, for a mobile-first startup, Tinder has been missing a huge piece of the smartphone puzzle: To date, the app has only been available on the iPhone. Beginning today, however, with the arrival of Tinder for Android, the popular mobile dating app is going multi-platform, opening its doors to users of the mobile operating system that now owns over 70 percent of smartphone marketshare. In the lead-up to the app’s arrival on Google Play, the Tinder founders decided to take a somewhat unusual approach to drumming up attention for its new app — another testament to how popular the app has become. Instead of simply launching the app on the app store as is normally the case, several weeks ago, the company created a landing page for the new app, saying that they would only make Tinder for Android available once they had received one million requests (via social media). They haven’t quite made it to one million requests, Rad says, but with over 800K already logged, the founders decided to pull the trigger anyway. In its port from iOS to Android, fans of the mobile dating network will be pleased to learn that there haven’t been many changes to the overall user experience, other than some requisite optimizations for its new operating system. It’s still the same model: Once a user signs in, they’re shown snapshots of local singles based on location and mutual interests. They can “like” or pass each match as it appears and can decide to chat or meet up only when both users show interest (i.e. “like” each other). It’s this simple model, which encourages people to make snap judgements of each other based on a few photos and some basic profile information on mutual preferences, interests and friends, that have led Tinder users to make over 7 billion profile ratings. 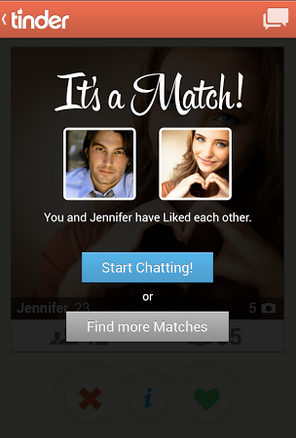 For those looking for long-term, serious romance, the eHarmony and OKCupid approach is likely to have more appeal, but for younger users interested in a quick way to meet people and a casual way to flirt, Tinder has (thus far) been taking the cake. As we wrote earlier this summer, based on its surging popularity among young people, rumors had been circulating for months that the company has been in the process of raising a huge round of outside financing or was busy looking for a big-figure exit. Today, both of these remain untrue and, while the startup is still not sharing how much capital it has in its coffers, IAC is (and remains) its primary investor and stakeholder. For those unfamiliar, part of the reason Tinder has been able to do what it has over the last six months is that it’s been able to learn first-hand from the giants of Digital Dating. The startup was incubated at Hatch Labs, a new Los Angeles-based startup and accelerator backed by the aforementioned IAC — the same Barry Diller-led digital media giant that happens to own dating veterans Match.com and OKCupid. As a result, IAC maintains “first-dibs” rights to investing Tinder and has been the “sole investor in its seed and series A rounds,” which we’ve heard total in the millions (and likely more than a few “millions”), we wrote at the time. With enough runway and plenty of interest, Tinder has also begun to focus on international markets, as the CEO told us at the time that over 15 percent of its users now hail from outside the U.S. Going forward, the startup has begun focusing its international efforts on the UK, Canada, Australia, Latin America (particularly Brazil and Mexico), Germany, France and Japan and is in the process of adding further language support, localization and is hiring local reps in each of these countries. Rad also told us in May that Asia remains a potentially big opportunity for Tinder, thanks to “the explosion of mobile adoption.” To be sure, whether it’s Asia as or in other target global markets, the launch of Tinder for Android will be a key to unlocking continued growth in these regions. As Ingrid recently wrote, Google’s global share of smartphone sales was 64 percent in March and, with Android’s “share rising in every market over the last few months,” it will be approaching 70 percent soon. Since the beginning, the Tinder founders have been hesitant to refer to their product as a “dating app,” as their long-term plans involve expanding the growing network beyond dating. With the stigmas that have traditionally come with “Internet dating,” this isn’t particularly surprising. No one is eager to be painted with the “superficial dating app” brush, even if in this case, the glove certainly fits. However, the company has been making its first steps toward expanding the Tinder experience beyond dating, launching a new feature called “Matchmaker,” which enables users to create matches between any two Facebook friends for any purpose — flirting or otherwise. As we wrote in May, the idea behind the new networking tool is to create a “casual, simple way to make an introduction, whether you want to set two friends up on a date or make a professional introduction or connection,” while maintaining the anonymity of the typical Tinder experience. But, as a decidedly free app, the Tinder team has been experimenting with ways to allow big brands to connect with its droves of young users — a coveted demographic for many advertisers — and with ways to monetize. While Rad tells us that its newest promotional deal does not in fact represent its current or future efforts to monetize, it does indicate potential roads the company could take to ramping up revenue generation. As Variety and others have reported, the first brand (and TV network) to hook up with Tinder is USA, which launched a promo last night that’s targeted at younger generations ahead of the Season 3 premiere of its popular show, “Suits.” The Tinder CEO tells us that the company has had similar interest from a number of TV networks and brands, but they opted to go with USA and Suits because the network’s vision was the most closely aligned with their own — and because Rad himself is a fan of the show. When and if a user “likes” one of the characters, they’ll be given access to “exclusive content” from the show, which basically means sneak peeks, audio greetings and clips only available on the Tinder network. The characters from the show will also be choosing a few power users to “like” back to engage in a little live flirting over chat and, depending on how things go, maybe even live, in person. It remains to be seen whether or not this will appeal to Tinder users or just be a nuisance, but even though both parties were firm on the fact that no money exchanged hands as a result of the partnership, users can expect more of these types of promos within Tinder going forward. Sure, few Tinder users are probably champing at the bit to see their favorite mobile dating app begin to monetize, but, at at time when even the former “Miss America” is discovered to be using Tinder, the company would remiss not to take advantage of its 10 minutes. 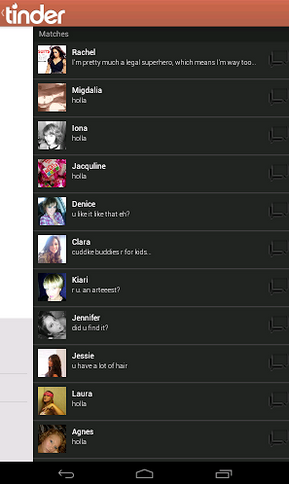 Especially before users discover that the hot date they’ve been falling in love with is actually just a spambot. 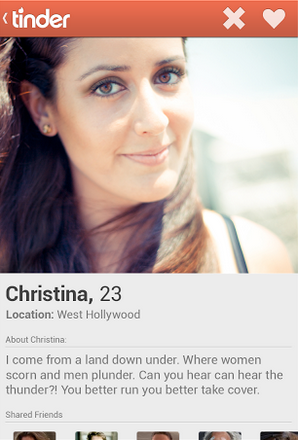 Tinder on Google Play here.